The back of the eye is covered by a tissue, comprised of different layers, that is responsible for the conversion of light into neural signals and in turns it allows us to see. This tissue is called the retina. 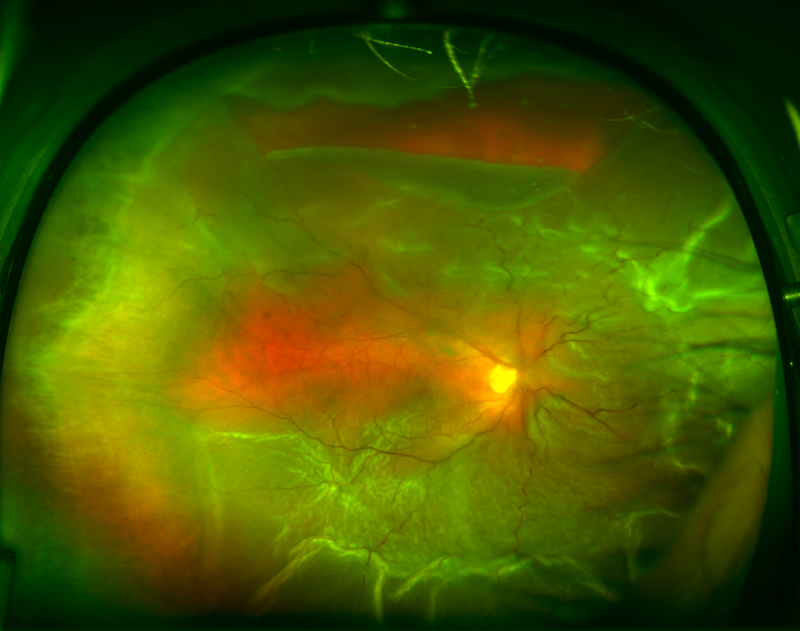 The retina can come away from the other layers of the eye. This happens if there is a defect (a tear or a hole) in the retina that can allow fluid to pass through the defect and hence detaches the retina from the surrounding tissues. Most retinal detachments develop suddenly (although that is not always the case) and the patient presents with sudden onset of flashing lights, floaters and a dark shadow that obscures the vision. Rarely, retinal detachments can be asymptomatic. If retinal detachment is left untreated it normally leads to total loss of vision in the affected eye. Although retinal detachment is relatively common (one in 10, 000 per year) and it can occurs as part of normal age related changes in the eye, there are some people that have increased risk. People that are short sighted or have had trauma, previous cataract surgery, especially complicated or family history are at higher risk of getting a retinal detachment. It is also known that if one has had a retinal detachment in one eye, there is an increased risk of getting one in the other eye. The treatment is surgical. There are mainly two surgical approaches to treat retinal detachments – Internal and External. The internal approach is called pars plana vitrectomy, which is a “key hole” surgery. It involves removal of the vitreous (the jelly of the eye), finding and treating the break of the retina that has allowed fluid to accumulate underneath the retina and then putting a special tamponade (either a gas bubble or silicone oil). If gas is used, the patient would not be able to fly and will have very blurred vision for a few weeks while the gas bubble spontaneously disperses. On the other hand, if silicone oil is used there are no restrictions on flying but a second operation is normally required to remove it. The surgeon will make the decision on which tamponade is best for each individual patient. The second and less common approach is the external. The surgery is called scleral buckling with cryotherapy. It is usually the preferred method of surgery in younger patients. This involves applying cryotherapy to the retinal hole and then placing a silicone rubber (buckle) on the sclera (the outside wall of the eye). That in turns creates an indent inside the eye that helps with the resolution of the retinal detachment. The success of retinal detachment surgery is approximately 90% with one surgical procedure. This is anatomical restoration of the architecture of the eye, it does not always correspond to full visual recovery. Retinal detachment surgery can be done under local or general anaesthesia. Usually, if a decision has been made to perform the internal surgical approach (pars plana vitrectomy) then the majority of cases would be done under under local anaesthetic as a day case. This means that the patient is fully awake during the surgery and can go home afterwards. A local anaesthetic is injected around the eye and for the duration of the surgery the patient is asked to keep still and lie on his/her back. The average time of the procedure is one hour. If the surgeon has opted for the external approach then the preferred method of anaesthesia is general anesthesia. In this case the patient is asleep; however, that might require further investigations to assess the patients’ general health.